An overworked subscapularis muscle may make you feel like you are not able to lift your arm. It may be even responsible for your frozen shoulder. People in which this muscle is too tight, often have a “round back” and inwardly rotated shoulders. They also might be fans of excessive chest workouts, rock climbers or gymnasts. When trigger points are present in your subscapularis muscle, they can give you pain right at their location. But also other, seemingly unrelated areas of your body may be affected. 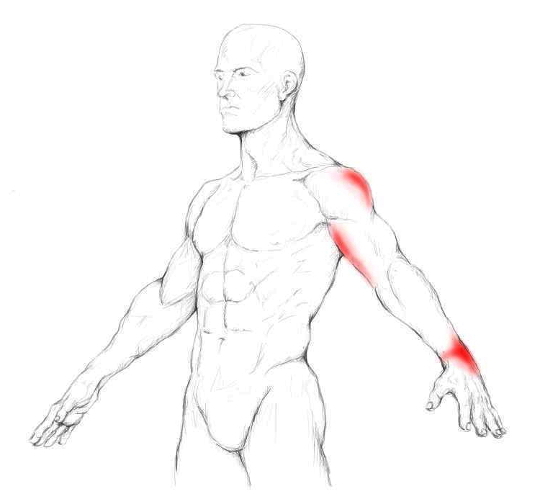 The main area that you might feel pain in when your subscapularis contains trigger points, is your shoulder blade and the back of your shoulder right above your armpit. Beside that, pain can radiate down the backside of your upper arm to your elbow or to your outer and inner wrist – Pain at the inner wrist is not shown in the pictures–. Click on the link and learn how to relieve pain in this area. The red colour shows you how common it is that pain is sent to the respective spots. 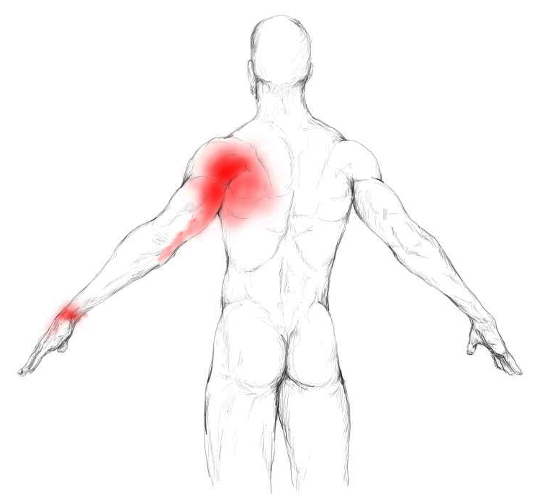 The darker the red, the more common it is that you experience an ache in the particular spot when your suscapularis contains trigger points. If you suffer from tenderness in the subscapularis muscle you may be unable to lift your arm more than a 45° angle. Also reaching over to your other shoulder can be a painful task. The muscle may be just too tight, and elongating it, which is necessary for lifting your arm, is too painful because of the massive tension in it. The subscapularis muscle attaches in a planar manner at the inner side of your shoulder blade and connects also atyour tuberculum minus of your humerus – the inner and upper side of your upper arm bone -. The Xs in the picture display common areas where tender and trigger points develop in this muscle. The best known function of this muscle is the inward rotation of your shoulder. When you let your arm hang loose in the neutral/normal position and then turn your arm in a way that your thumb is first facing to your hip and then backwards, you are doing an inward rotation with your shoulder. Furthermore it adducts/pulls the arm towards your body. As it is a muscle of the rotator cuff it also stabilizes the shoulder during its movements and keeps it in its socket. Excessive chest workouts can cause trouble. Because almost every exercise that focuses on strengthening your chest involves an adduction of your arm and an inward rotation of your shoulder. Those are the movements that stress your chest and thus make it strong. The subscapularis has the “same” function and gets activated during most chest workouts, respectively. It also has to work hard to stabilize your shoulder. Almost every time you train your chest, you also train your subscapularis. By overdoing it here, you can easily overwork your subscapularis muscle. 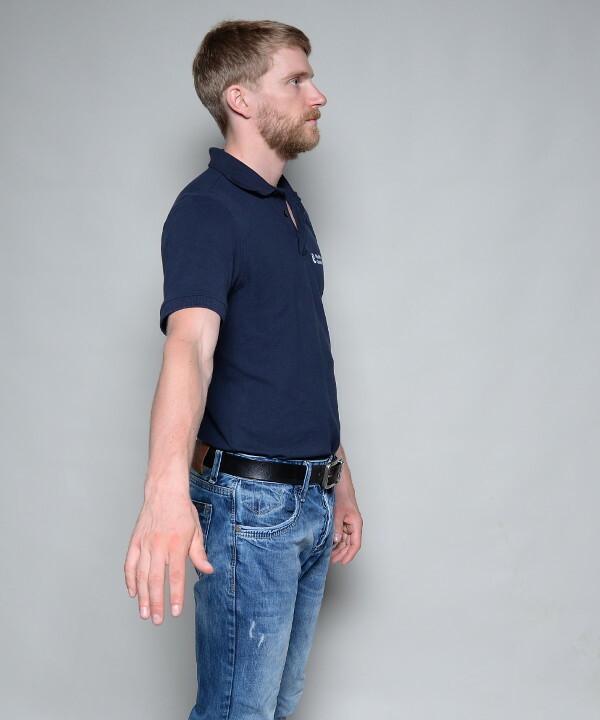 Bad posture gets often associated with a round back and a crouched chest – picture -. Being in such a position for a long time means that your shoulders are constantly rotated inwardly. Thus your subscapularis always finds itself in a shortened position. Being in this position for too long causes this muscle to tighten up and eventually troubling you. Acute traumas like slipping on the stairs and reflectively holding to the handrail is likely to give you trouble. When you slip on a stair and have your hand on the rail, your arm automatically gets abducted/lifted as your body drops. By now you know that the subscapularis does an adduction of the arm, which is the opposite from an abduction. When you slip on the stairs and hold to the handrail, it gets stretched while you are pulling down on the rail to prevent yourself from falling. To feel the muscle, sit down on a chair or bend over. Let your arms hang loose. Now take one of your hands and feel with your fingers into your opposite armpit. Then start to rotate your shoulder inwards repeatedly and search for the subscapularis muscle bulking up with that movement. If you go deep enough, there is only one muscle in your arm pit. So if there is something bulking up you can be sure you found the right spot. A word of caution: Take your time locating the muscle and be gentle! You are working in an extremely sensitive area of your body that contains lots of nerves. Absolutely be sure to work only on the muscle. Feel it contracting, then release the tension and start to massage it. Make sure you only massage the muscle and not your nerves. Otherwise you are likely to end up with some pain for quite a few days because you stressed the nerves in your armpit instead of the muscle. After some time you will get a feeling for how a muscle feels and you will become able to distinguish it from your nerves just by feel. For massaging the subscapularis muscle use your thumb, and the precise massage strokes or the pressure-motion technique. Search for tender spots in the muscle. If you have trouble massing the muscle while it is relaxed, just tense it. This means, execute a medial rotation (as you have done when you palpated the muscle), and massage the muscle while it is contracted. This also works suprinsingly well. Now move your arm through various positions (lift it, lower it, rotate it). Concentrate on the painful ranges of motion.